MUNICH, Germany, September 19, 2012 – When Fonckel B.V., a start-up company based in the Netherlands, needed expert assistance to turn the stunning design of its Fonckel One lamp – an interactive light emitting diode (LED) luminaire – into a commercial product, SABIC’s Innovative Plastics business was there to deliver its world-class customer support. With its robust portfolio of advanced thermoplastics for lighting applications, its Color Innovation Centre offering more than 18,000 color and diffusion effect options, and its application development expertise, SABIC assisted Fonckel with tapping the proven performance and versatility of LEXAN™ FXD polycarbonate (PC) resin for use on the lamp’s diffuser cover. On display here at the Strategies in Light Show at SABIC booth #B8, this unique luminaire, the name which means “sparkle” in Dutch, demonstrates SABIC’s ability to precisely meet the specialized needs of its customers by helping them translate their design vision into the right material application. Through SABIC’s distribution partner in the Benelux, UltraPolymers, Fonckel approached SABIC to find a high-quality material offering white colors for the diffuser cover that also met the strict requirements for custom effects, suitability for laser welding and exceptional optical and mechanical performance. 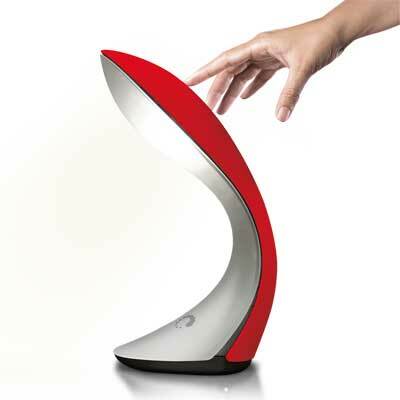 Fonckel B.V. develops intuitively controlled lamps on the basis of patented interaction technology called lumotion®. The Fonckel One, an interactive designer lamp developed and produced exclusively in the Netherlands, is easily and intuitively controlled and offers maximum flexibility in the user’s relationship with light. The direction, intensity and breadth of the bundle of rays are regulated by simple movements on the touch-sensitive frame, similar to those used on tablets and smartphones, enabling the user to adjust them as needed. Fonckel One will be available for sale in Europe in October. For more information on Fonckel B.V. or the Fonckel One lamp please visit their website at www.fonckel.com. SABIC’s Color Innovation Centre played a major role in the development of the Fonckel One diffuser cover. The facility in Bergen op Zoom, whose staff comprises more than 30 years of expertise in color and effects technology, also offers more than 18,000 different color and effect choices. SABIC Color Innovation Centres around the world provide rapid response: on-site colorists help customers create custom colors and apply special effects in as little as a day. For additional information on SABIC Color Innovation Centres around the world, please go to www.sabic-ip.com. Equally important to this project was the high-performance of LEXAN FXD resin. This transparent/translucent low-viscosity grade for light diffusion special effects enables laser welding, which is used to join the diffuser cover and the back cover of the luminaire. This quality of LEXAN FXD resin is important as laser welding is becoming increasingly popular for lighting applications.